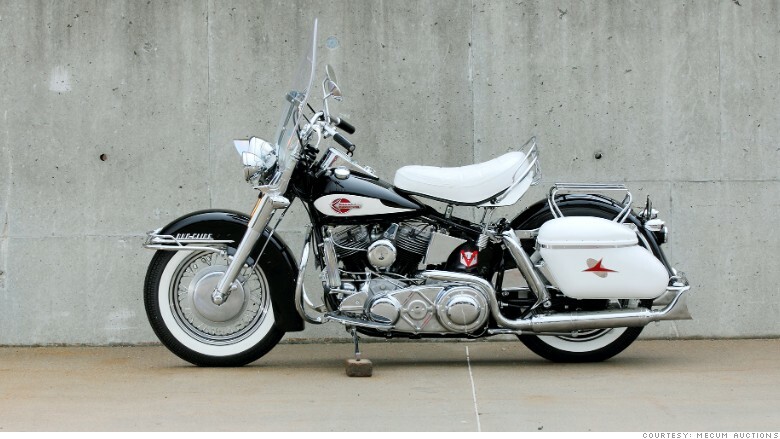 This Harley was owned by Jerry Lee Lewis. There's a whole lotta shakin' goin' on in Harley's stock too. Investors looking for adventure and whatever comes their way like Peter Fonda and Dennis Hopper in "Easy Rider" were hopefully not doing so with Harley-Davidson stock on Tuesday. Shares of Harley-Davidson (HOG) are down more than 9% in early trading. People just weren't buying as many Harley motorcycles lately. Even worse, the company warned that future sales may be more born to be reviled than wild. Harley-Davidson doesn't expect to be shipping as many bikes this year, and it's the latest company to complain that the strong U.S. dollar will have a bigger impact than previously expected on revenue. But is this sell-off overdone? The company's classic choppers are still popular with motorcycle enthusiasts. And they are becoming more ubiquitous in emerging markets too. CEO Keith Wandell said in the company's earnings release that sales were up "significantly" in India, China and Mexico. But Harley-Davidson also faces tough competition. The company specifically said that "increased, aggressive competitive motorcycle discounting" was one reason why U.S. shipments were down from the first quarter. Snowmobile manufacturer Polaris (PII), which also makes the Indian brand of motorcycles, is making waves in the market, especially with its three-wheel reverse bike called the Slingshot. Polaris will report its latest results Thursday and it looks like investors are growing increasingly nervous about how a motorcycle price war will hurt sales and profits for the whole industry. Polaris shares fell 3.5% Tuesday morning. But the biggest threat for Harley comes from its overseas rivals. They're the ones that are able to benefit the most from the stronger dollar. Imports from Japanese motorcycle makers Yamaha (YAMHF) and Honda (HMC) and Europe's BMW (BAMXY) are more attractive to American consumers because the dollar has fired all of its guns at once and exploded into space versus the yen and euro this year. Still, it seems that the big drop in the stock Tuesday might be a bit of an overreaction. The company cited data from research firm Polk that showed that Harley was the top seller of motorcycles in the U.S. last year with virtually every major demographic: adults aged 18-34, women, African-Americans, Hispanics and white men over the age of 35. And this has been the case for seven years. Harley has been buying back stock and it pays a healthy dividend that yields 2%. Analysts still expect profits to increase more than 15% a year over the next few years. But investors still have good reasons to be nervous. The stock has lagged the S&P 500 for the past few years. It hasn't been taking shareholders willing to head out on the highway with it on a love embrace.